! This is NOT a method of direct communication with HEART TO HEART for purposes of ordering or rectifying problems. Wonderful service and GORGEOUS flowers! Website was easy to use and flowers delivered were exactly what I ordered. Thank you so much for your promptness and kindness! It was our pleasure! Thank you for your business! Thank you for the positive feedback! We are happy you were pleased with your order. Everything went so smoothly. Ordering was easy. The flowers were delivered in good time and were beautiful. The flowers that was sent to my mother were beautiful. She received many compliments. Always great service. Went above and beyond. Called and made sure I got exactly what I wanted. My mother-in-law loved her flowers. I will be using them again. We are so happy that you enjoyed your flowers, and we appreciate that you will be calling us again! We look forward to serving you! What I ordered wasn't available..the ladies promptly called to let me know product was available. They actually created a perfect floral arrangement instead. My only suggestion would be to stay on top of what's available or not. Maybe incorpate "seasonal" title on arrangements. We are thrilled that you loved your arrangement, and thanks for the suggestion! I've used Heart to Heart a few times for anniversary arrangements and they have come through on time, at budget, every time. The staff is very reliable, they make a great quality product, and provide superlative service. I particularly like the fact that they ask me what my wife's favorite color/flower is and if she has any allergies that might affect what they use to construct the arrangement. The era of personal service is not over in Madisonville. I just want to tell you guys THANKS for the delivery on such short notice! You guys are awesome.Thanks again! Flowers looked and smell great even an week after!! Flowers were on time and BEAUTIFUL! Thank you Heart 2 Heart for doing such a beautiful job on the flowers at Amy's wedding. They were unbelievablely gorgeous and the staff was amazing!!! Thanks for all your hard work and making the trip to Austin. Everything was perfect! Ya'll are the Best! Thank you for putting together the beautiful arrangement on such short notice! 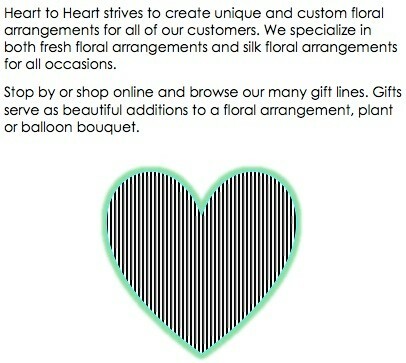 Getting flowers to a funeral from out of state was made easy thanks to Heart to Heart. Thank you!! We so appreciate your encouraging words and so happy you were pleased! It was a beautiful spray. I have a florist available but prefer Heart to Heart. I also like the online ordering feature. Thank you. Thank you for going above and beyond to create a very special beautiful arrangement. Appreciated your follow up call and ultimately coming through with the perfect arrangement and a photo! Thank you to Heart to Heart for accommodating our needs for a cemetery-only service. You created such lovely, fresh flower arrangements not just for my mom's funeral but for my daddy's funeral as well almost 5 years ago. Very easy to order online, and then easy to talk to by phone for special circumstances. Bravo! My sister Loved her Birthday Bouquet. The picture she sent me was beautiful. Thank You!! Our Cousin was most pleasure with the alternative flower arrangement. Yay!!! We are happy she was happy on her birthday!!! The flowers were beautiful and well received by the Knight family. I know they value the Madisonville community and their hometown businesses, so I was glad to use your service to send them flowers, and you delivered a professionally organized, beautiful arrangement. Thank you. The spray arrangement for my brother's service was absolutely gorgeous! I was told because of the flood you may not have exact flowers available, you would do your best. WOW! It far exceeded my expectation. Thank you. Excellent customer service and the use of the website was efficient and very easy to follow. I appreciate the many choices and once I completed the purchase,the Manager of the store contacted me to confirm my order and explain to me the delivery process. It's a pleasure knowing you can do business with a "live person" and feel comfortable during the transaction. Thank you for all your assistance! Very pleased . It is a nice arrangement . Our elderly aunt so appreciated the beautiful flowers. Our cousin sent us a pic with her holding them. Thanks for doing a great job and getting the flowers to her on the requested day. Services was great and timely. I was informed that the specific flowers from the website weren't available but the arrangement would be equally nice. It was great my sister loved the flowers. I wrote an unhappy review at the beginning of December 2014, which I am happy to completely withdraw. Heart-to-Heart took the care and consideration to contact me by e-mail and telephone, to apologize, and to correct my order. Our Aunt was DELIGHTED with order delivered at the right time. It takes courage and heart to admit a mistake and to take care of it! That's true integrity! Happy Holidays! Sent flowers to sister in law. Let heart to heart pick out an arrangement. She sent me a picture of them and it was beautiful. Will definitely use them again . My mother absolutely LOVED the Gerber arrangement I ordered for her - Thank you Heart 2 Heart for doing such great job! My mother LOVED the chocolates as well! Thank you! You know I will always be back! I placed an order early Friday morning (the 9th) - very busy day for you all - You not only got the order to my sister but it was beautiful. I love Heart 2 Heart and thank you! It's the only place for me. We came to your shop last Tues to order flowers for my mother-in-law's funeral. We told the lady (Carolyn?) what we would like and wow, she really came through! It was the most beautiful spray I have ever seen. Thank you all SO VERY MUCH for making the process simple for us & for coming through in such a magnificent way!! If we ever need flowers again in that area, we will be calling Heart to Heart!! Delivery was made on time and matched what was ordered. My step daughter was in a car wreck yesterday morning. I ordered some flowers through FTD thinking they would arrive yesterday afternoon, they did not. I found Heart to Heart. I talked to Marvin and told him my situation.He told me him & his staff would get right on this and even if he had to drive the flowers out to her, he would. I live in Waco and it was such a blessing to have found this florist and exceptional service. My daughter loved her flowers! Thank you again for helping us through a stressful moment. The flowers were beautiful and arrived in time for my wife to be completely surprised! The arrangement was beautiful. Cynthia and her crew pulled it together on short notice after I had my order fouled with another floral network. I could not have asked for anything more. The service was excellent! I ordered the flowers for my youngest daughters Birthday and she loved them, beautiful!! Excellent service and beautiful arrangement, my sister loved them. You called to schedule delivery and kindly waited until it was convenient to our recipient. Thank you. The greatest service ever!! My favorite Florist by far!!! The flowers were perfect and my daughter loved them! The flowers arrived sooner than expected. The recipient was very pleased with the arrangement, so I assume it was very nice. The people at Heart to Heart were very pleasant and easy to work with. I would definitely use them again. Awesome arrangement delivered by even more awesome people! I ordered the "Brilliant Sympathy Wreath" for a dear lady who was fond of my peacocks, and asked if a few peacock feathers could be included in the wreath, if they were available. You were able to include them in the arrangement, making it very special. Thank you for having the "special instructions" box included in your online ordering. That is a very nice touch, and it is good to know that you took pains to make sure the arrangement was not only beautiful, but special to this occasion. I bought the "Spring Smiles" bouquet for my mom who lives in Texas. She loved it and said it lasted a while. Thanks so much for making my mom smile! The service was great and the flowers were beautiful! It was a beautiful experience, great service! Mom said flowers were beautiful. They arrived at the time I requested, and I loved being able to order on line without having to pause and ask questions. The arrangement was beautiful. Thank you.